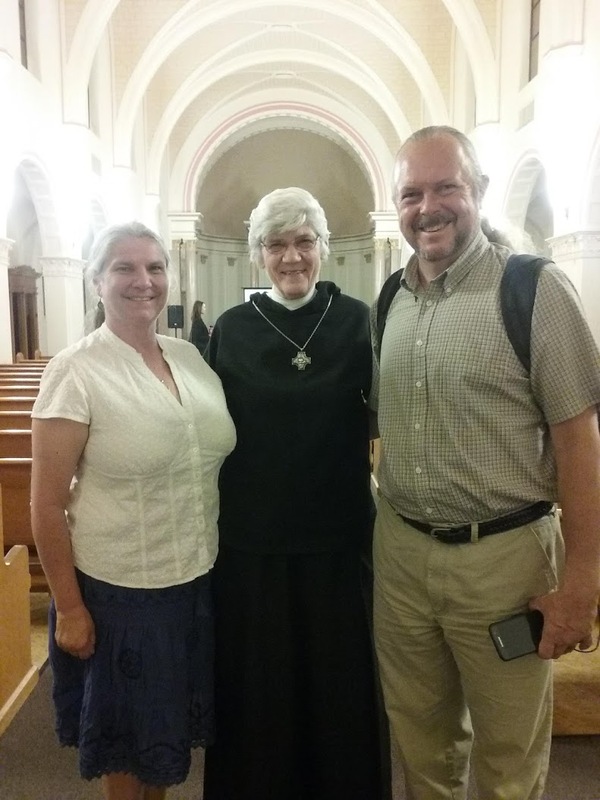 After a gallant effort to keep the monastery open, the Benedictine Sisters of Perpetual Adoration finally had to close their beloved home in February and return to the mother house in Clyde, Missouri. This was a sad day for the Sisters, the congregation and for our Tucson community. There has been considerable coverage about the developer, city council and neighborhood associations battling it out over the details of the development plans for the monastery property. I would like go to a happier place and share some lesser known stories about the Benedictine orchard and garden that nourished the Sisters and our community for over 70 years. I want to thank Sister Cecilia Rose, Sister Joan Ridley, and the community members for sharing their stories. I met Sister Cecilia Rose after the neighborhood meeting at the Monastery. She kindly agreed to speak with me in the orchard. 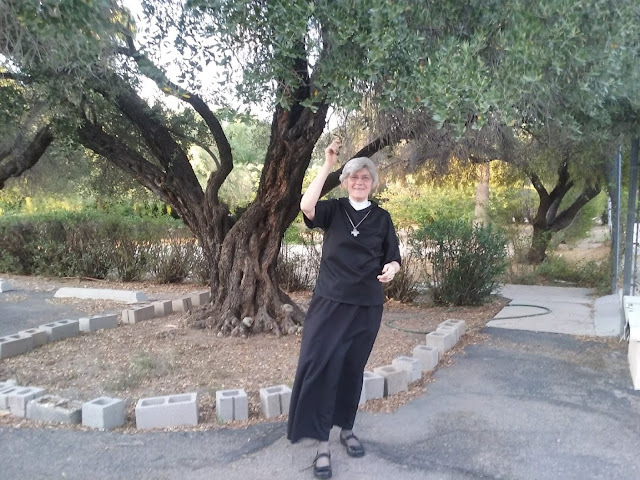 As Sister Cecilia Rose shared her memories in the lovely Benedictine Monastery orchard and garden, I pictured nuns in full habits and veils up on scaffolds hand selecting date palms. As the summer breeze ruffled leaves, I could almost make out the laughter of the sisters acting out the disciples reeling in 153 fish. Sister Cecilia Rose shared so many happy memories! So many acts of generosity! Knights of Columbus families picking and juicing oranges as the aging nuns kept the younger children busy. Iskashitaa refugees holding nets under fearless tree climbers. We used to come out here for recreation in the early days because we didn’t have that much contact with people. Because we were considered semi-cloistered. We’d perform biblical scenes to entertain ourselves. -- fish that the disciples brought in - in that story after the resurrection. The disciples weren’t catching anything. And Jesus was standing on the shore. He said throw it on the other side so they caught a whole net full. We had a Sister behind the bush. And we were acting like we were tossing a net to bring in the fish. But it was actually a volleyball net. We had a sister playing Jesus who said, “Throw it on the other side.” We threw it out there into the bush and the Sister (whose laundry number was 153) got into the net and we started reining her in. We used to do things like that to entertain ourselves. We didn’t have television. We didn’t have radio. We didn’t have anything like that. We didn’t have computers. We just had each other and your spiritual director and especially in the beginning you had your postulant director who tried to introduce you to what the schedule would be and how you were supposed to act. The reason we were called the Benedictine Sisters of Perpetual Adoration is because we prayed for the whole world, for all people for all time. There was a reverence you were to have about everything, because the Benedictine’s had this rule that all objects were to be treated as if vessels of the altar. So you should have a reverence for everything and everyone. Because Christ is the one who gives life. Creation is a part of us and must be honored. 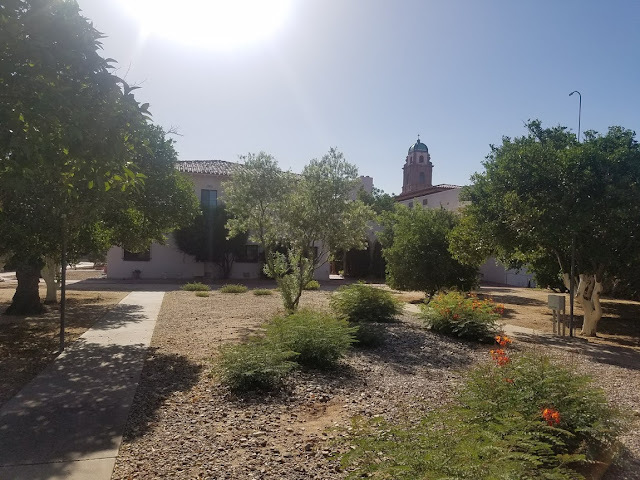 The Benedictine Sisters of Perpetual Adoration moved to Tucson from the Midwest in 1935 and onto the Country Club road property in 1940. First thing they did was dig a well. No “city water” existed then. 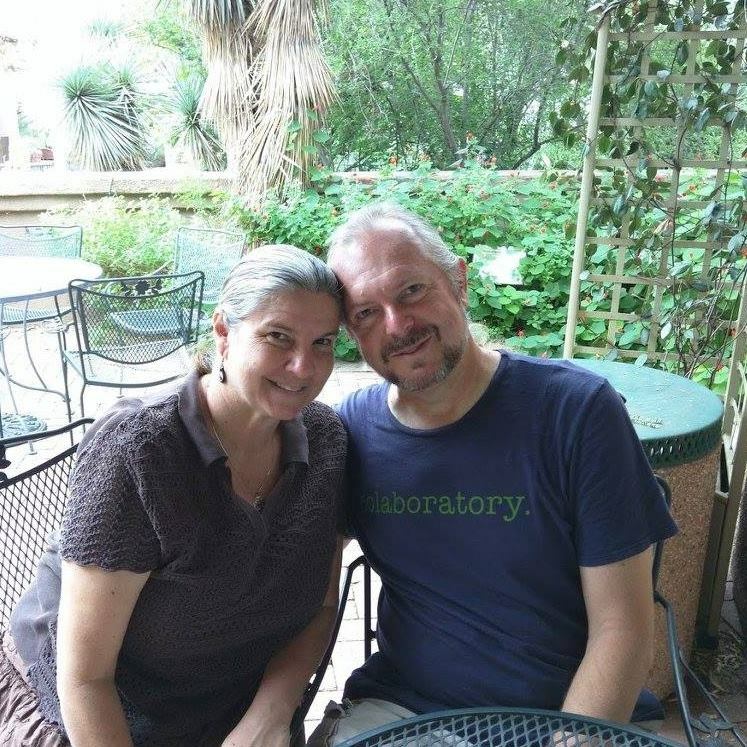 There was a community garden, one of over 30 operated by the Community Gardens of Tucson. It was opened up in 2008. It was open to anyone who wanted a plot as long as they took care of it. They had to pay $15 a month for water, CGT expenses for piping, fencing and administration. We had a garden manager who would see if anyone wasn’t taking care of their plot, he would take it away from them and give it to someone else. I had a plot. I tried to grow lettuce and I tried to grow celery, I think it was. Something that we could bring in. I did bring in something but it sure didn’t last long. Trying to feed, at that time, 30 people here, 3 or 4 heads of lettuce was gone in one meal. The Benedictine garden meant a lot to me. It was such a beautiful, tranquil spiritual space. I would usually come very early in the morning, sometimes as the sun was rising. First there was the beautiful sight of the monastery. Then after walking past the fountain and listening to the trickling of the water, almost like a mountain stream, you would come into the garden and the cityscape disappeared. Often Sister Cecilia Rose would appear looking for the church dog who would usually have already come to greet me. To see a sister in garments in the early morning light was also a look into times past. It was a comforting feeling, especially knowing that she was a person praying for peace in the world. I would often leave extra vegetables for her. She would tell me how the cook had integrated them into the previous night's meal. What a wonderful feeling to be able to have your vegetables enjoyed by such a loving group of people. Often I would walk to the enclosed courtyard garden that was a part of the church. I would leave my extra garden bounty there for them to fetch and use. It was also to admire the rare sight of a decades old fruiting avocado tree. 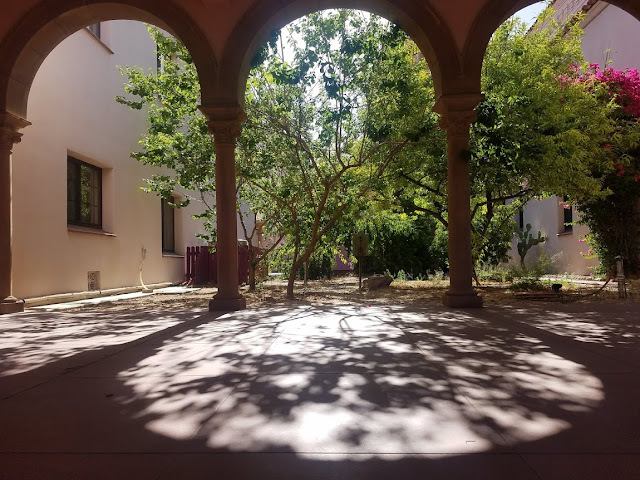 It almost was saying "Only here in this courtyard could I thrive in Tucson". It was loved and protected. 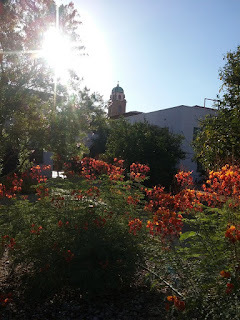 To me community gardens say "Tucson". They make me feel proud to live here. It is probably part of the reason why Tucson has been named a Unesco City of Gastronomy. I tagged along with Jesus Garcia as he took cuttings from the Valencia orange trees for grafting at Mission Garden. It was like stepping back in time being in this orchard that is nearly as old as the monastery itself, being more than 75 years old. Jesus identified plants including Tucson’s oldest and largest and best producing avocado tree, three varieties of pomegranate that can only be found at the orchard, a sapote tree, a unique large sweet lime, and a date and citrus orchard, among other trees. 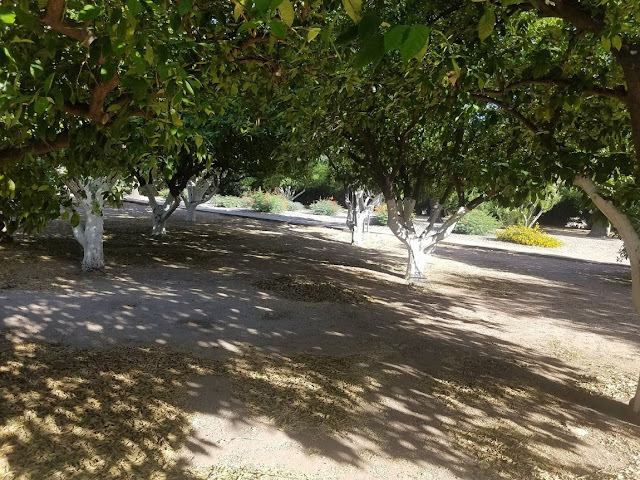 Thanks to years of care from the nuns, a University of Arizona arborist, and many others, I was delighted to see that all of the trees are currently in good condition. Date palms, that were planted in the 1940s, are interspersed among the orange trees and elsewhere. They have a glorious history. When the trees were of ‘picking’ height, the sisters themselves (with a ladder or low scaffold) used to hand pollinate and hand select and pick the dates as they ripened. [Not all dates on the same stalk ripen at the same time]. Then they cured the dates in some ancient machinery involving gas, pitted them and made hand crafted delectable Date Candies, boxed in lovely arrangements for sale. In fact, there was a sign at the front door of the monastery “Dates for Sale”. That wording may have caused some confusion! Date trees grow tall fairly quickly and the diameter of the trunk varies from year to year depending on water conditions. Though we watered them with well water, the trunks have ‘narrower’ spots and they are now very tall. 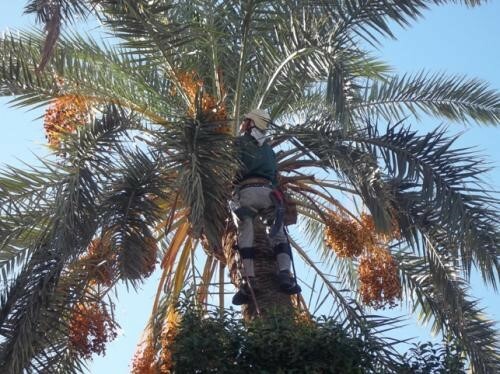 In the last 20 years, we had to hire a professional, who used either a scissor lift or cleats on shoes, to climb them and cut down fronds - trying to guess when the most dates are ripe. It is not a very successful outcome as for getting edible dates. But we got some, cleaned and bagged them. 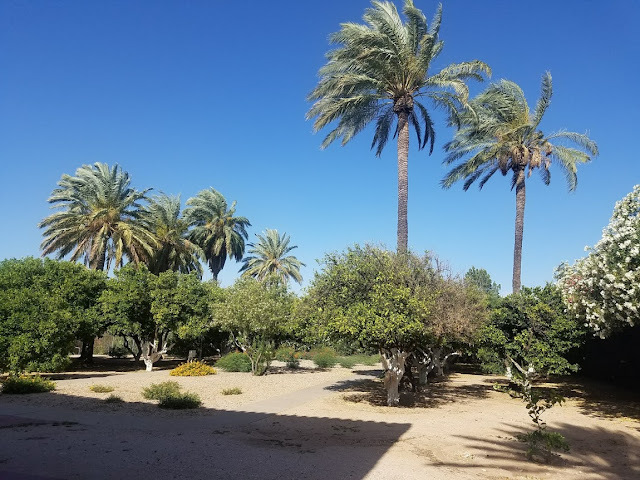 Over the years, about half of the date palm trees have fallen down in high winds or been removed due to danger to the monastery if they would fall. About 35-40 orange trees were planted in the 1940s. In the last 10 years we have had to take down about 1/3 of them due to age and gradual failure. Their frailty may have been compounded by a long-ago landscape employee who trimmed off all the low branches, exposing the trunks to the hot sun and then painting them WHITE [!] -- we are not sure. The original trees are not a particularly rare type of orange tree. They are VALENCIA oranges, a very nice smaller orange for juicing, often planted in the big commercial groves in California and Florida, and a few groves in Tucson [think “Orange Grove Rd”]. New, replacement orange trees are of other varieties sold in nurseries. We had an old machine that would juice the oranges. And they would do all the juicing for us. They would put juice in these one gallon containers. There was about 100-150 gallons each year. And we would put them in the deep freeze. We always gave them a one gallon container for coming. Or usually they wanted oranges because we had a lot at that time. We always gave oranges away because we had too many. We’d be doing all this juicing and we’d give the juice away, too. And we’d give them as Christmas gifts too - to people who’d been so good to us. That’s what we did; harvested the oranges and juiced them with an old commercial juicer. It took about 40 volunteers to get the oranges off the trees in one day, sort for size, and wash them. Then it took another 4 volunteers several days to juice them. We froze the juice and used it all year round. We would give about half the oranges, that were too small for the juicer, to one of those organizations around town who will come get the fruit from homeowners who either were too elderly or no longer have an interest in picking the citrus fruit from their trees. (Usually they pick; but we were able to.) We irrigated the trees with well water. They are certainly something we used, loved and appreciated for over 70 years, but I am not sure they are worth a big fuss at this point. One of my memories in the Benedictine orchard is harvesting fruit with Iskashitaa Refugee Network. We sometimes brought a group of resettled refugees there to pick citrus. One of our goals is getting our volunteers out into the community, and interacting with a variety of people around town. The sisters were very welcoming, and the orchard was a pleasant respite in the middle of the city. We have had multiple years picking, perhaps as far back as the last 5-6 years. When Sister Ramona starting harvesting the dates again (after a hiatus due to lost internal local food knowledge), Iskashitaa thought they could learn or offer their global expertise. 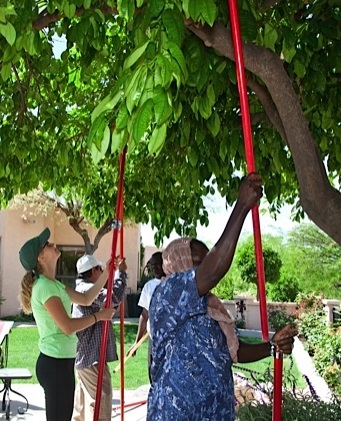 After offering to sponsor their date palm tree harvest fees (at that point $25/tree), we lobbied Bartlett Tree Experts to lend their time, sweat, palm expertise, and bucket trucks. Bartlett folks were great and generous. One year, they had highly experienced tree climbers harvest with Iskashitaa- a treacherous job from our viewpoint. With a small fire brigade-like crew below the date palm, yelling, “jump, jump” for the dates to drop into our community held net. What an experience and new appreciation for the arborist and the landscaper’s work and especially those who climb palms of any sort. As a show of appreciation, Iraqi refugees gifted Iskashitaa made date rewards to the monastery sisters and Bartlett - including bottles of date syrup and date vinegar made from fermented date pulp. Definitely think yum yum. The sisters used to dry the dates in the large ovens in their enormous basement using only the pilot light, then package and sell in the gift shop after the nuns had their fill. They fed community goats substandard dates that were not grade A. This was a win-win collaboration between mother earth and faith-based, non-profit and for-profit entities. We had what we called the “Egg Lady” here at one time, Sister Mary Estelle. From 1974-1981, the people would come and she would give them three eggs and a cup of coffee. Oh! And she made egg salad sandwiches. She and her sister would work and make all those sandwiches. They would do it twice a day. We had a lot of students coming and a lot of homeless. They knew what time it was and they would line up at the back door here. That was something we saw as a need in those early days. Sister Estelle was walking out here and there were people sleeping under the bushes. It scared her half to death! She didn’t expect to see anyone. We were so strictly cloistered. Then other churches began to realize that people in Tucson needed this. 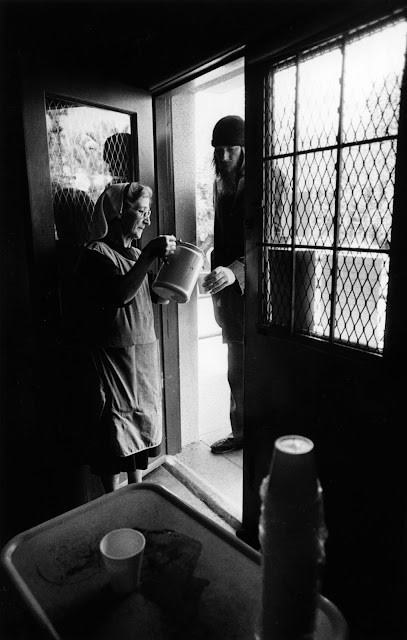 In the 1980s they started to open different places to feed the poor. But the Benedictine Monastery was the first place to do it. It was very popular and she was very popular. Sister Mary Estelle was really thin. She was a wiry thing. When she worked in the altar bread department she baked five stoves at one time. And most of us only did two or three. We sold altar bread to other places. We still have an altar bread operation in Missouri. The rule of St. Benedict, which is the governing document, says that the monks should earn their own living. So that’s why you hear about gardens and they ate the produce. Alter bread that they sell to other churches and they made church vestments here until quite recently. All of this, the nuns were doing the best they could to earn their own living. It was lovely hanging out with Sister Celicia Rose in the orchard and opening a little window into the lives of the Sisters at the monastery. At the end of our time together, I asked her how it felt being in the orchard. She answered, “That’s when you thought you were out in creation for sure in the orchard. You feel so close to God when you have so much of nature around you. You can’t explain it. It just is." Creation is part of us and it has to be honored. Iconic Tucson monastery spared as agreement is reached in apartment deal.